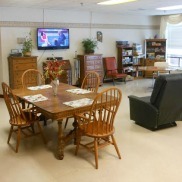 At Ashtabula County Nursing and Rehabilitation Center, our patients and residents enjoy spacious private rooms that provide solitude for rest and recovery. All of our rooms offer free extended cable packages, Wi-Fi Internet connectivity and local phone services. Because we have such a large facility, we are also able to provide ample space for gathering. This includes a restaurant-style dining room, a large community room, lounges with T.V. 's on each unit, a separate craft room, a chapel and a beauty salon. We also have both large and small rooms available for private family gatherings. To learn more about our accommodations, Contact Us to schedule a tour.